The story told by Allais starts in 1964, when Egyptian president Jamal Nasser, together with Soviet president Nikita Khrushchev, dropped the first stone of the Aswan dam in the Nile. The project was meant both to produce electricity and to render fertile large desertic areas. To do so, vast parts of the Nubian Nile Valley were about to be inundated, with the creation of gigantic reservoir lakes. At the peak of the Cold War, after a decade of tensions in the area – which included the invasion of Egypt by former colonial powers after the nationalization of the Suez canal – the dam was seen as a part of a broader project which was threatening Western influence in the Middle East. The Aswan dam was presented by Nasser as an emblem of pan-Arabic development and independence and by Krushchev as a device to “drown capitalism on the African continent”. Conversely, Western media – despite the project had started in the beginning as a Western-Egyptian joint, – depicted the project as the folly of a megalomaniac idiot – or simply “Nasser’s Pyramd”. But it was another megalomanic project that attracted UNESCO and Western diplomacy as a the means of counter-attack to Arab-Soviet supremacy in the area. The temples of Abu Simbel, built by pharaoh Ramses II around 3200 BC, were were one of the monuments in the region of Nubia included in the areas that were about to be flooded after the completion of the dam. It is in the battle for the preservation of these monuments that architecture started to provide the tools for the organization of the diplomatic campaign. Firstly, the architectural mode of production was appropriated by beaurocratic apparatuses: architecture’s collaborative nature facilitated the creation of an international network of architects, engineers, archaeologists, diplomatic agencies, governments, etc. In other words, an “encounter between the modernist ideal of collaboration and the beaurocratic model of cooperation” occurred. Secondly, preservation theory exceeded its original disciplinary boundaries to provide diplomacy with the discursive framework it was looking for. In particular, the concept of Integrity “appeared promising to UNESCO because it described the quality of objects, subjects and sites all at once”. Integrity meant for UNESCO not only the integrity of an object itself and within its environment, but also it suggested a relation between ethics and aesthetics: “it could designate alternatively the material properties of the object that was being moved, and the moral fiber of the person doing the moving”. The morality which lies in the apparently neutral concept of integrity – similarly to the one that will appear some years later in the discourses on sustainability – goes together with its vagueness in meaning. In the various attempts to produce a viable solution for the salvage, the different national project teams interpreted the concept of integrity in different ways. 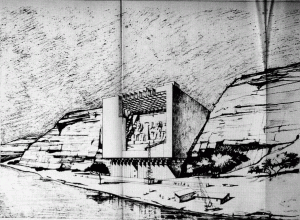 The French project, following the tradition initiated by Viollet-le-Duc would have understood integrity as “a condition of completeness which could never had existed at any given time, envisioning a monumental dam to protect the monuments from the flood. The Italian team, according to Cesare Brandi’s Theory of preservation, would have made a distinction between the artwork and its support, surrounding the temples with a brutalist concrete box, and lifting it 60 metres high through a sophisticated system of hydraulic jacks. Conversely, the British team, will opt for a romantic Ruskinian solution of letting the ruins of the temples to be flooded, constructing a series of underwater tunnels to let the tourist visit the monument. The story ends in a far less heroic fashion. The temples were sawed into blocks and re-composed on a hill some 100 meteres away from the original site. The cutting project, developed by a Swedish group, was three times cheaper and used local, manual labor, that could be payed with local currency. 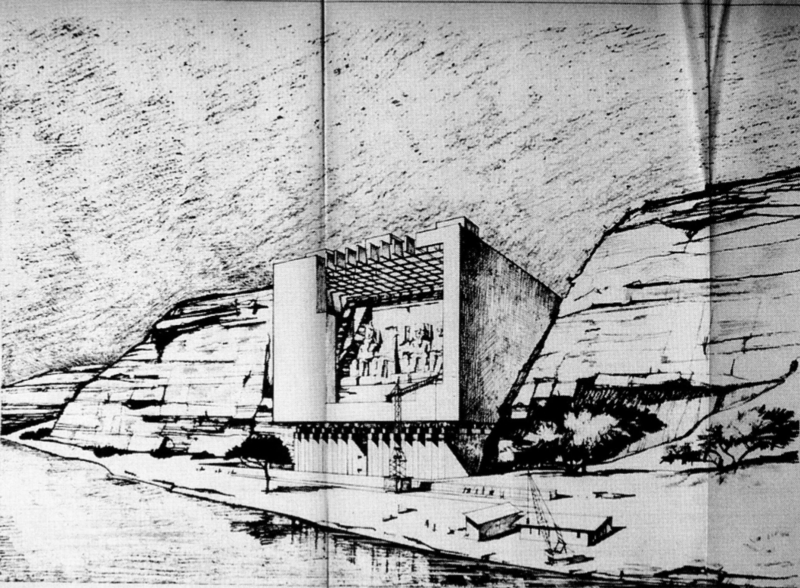 Despite UNESCO made an effort to present the salvage of Abu Simbel as a “purely cultural act performed by and for an abstract collectivity called mankind” (it is “The world [that] saves Abu-Simbel,” according to UNESCO’s journal), the operation was in fact developed in a far more prosaic fashion: the option to use local labor was favorable for the US government to save from devaluation some investments made in the area before the escalation of the Middle East conflicts. For Egypt, the US funding was an occasion to dismantle as many temples as possible, to store them, and to give them as a reward to other countries willing to contribute to the salvage operations. As a matter of fact, Italy, Spain and the US received a temple in exchange for their humanitarian good will (and funds), they had put in the area. Giorgio Agamben defined the act of profanation as returning sacred things to the free use of men. Indeed, cutting an ancient temple might seem as an act of ludic, dadaist blasphemy. “Ramses was plugged in, and it did indeed light up,” as Allais reminds us paraphrasing postmodernist architect Charles Moore.